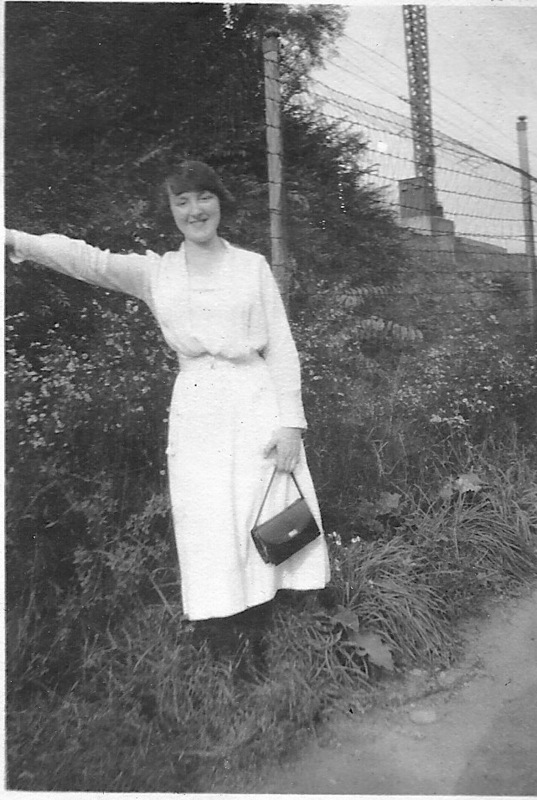 My grandmother, at 20, just after she came to America from Scotland. First of all, I went to visit my mom in Pittsburgh. We hung out and went through old family photos to see if she could identify some of the older generation. I ended up coming back with an album of my father’s family’s pictures to scan and “clean up” and put on disk. Both before and after this trip, I worked on Sunflower Lattice. The quilting is now all done and I’m about 2/3 of the way through the binding (thank goodness for Colin Firth!) But, yes, my cousin, the intended recipient, saw it, and yes, she says she loves it. So, lots of incentive to finish it. I pieced this blue background for a friend who intends to put LARGE applique fish on it. Miko says she can already see them! I have just resumed the Borderpalooza and all the spools are done (FINALLY!) and on the Japanese Cats quilt. 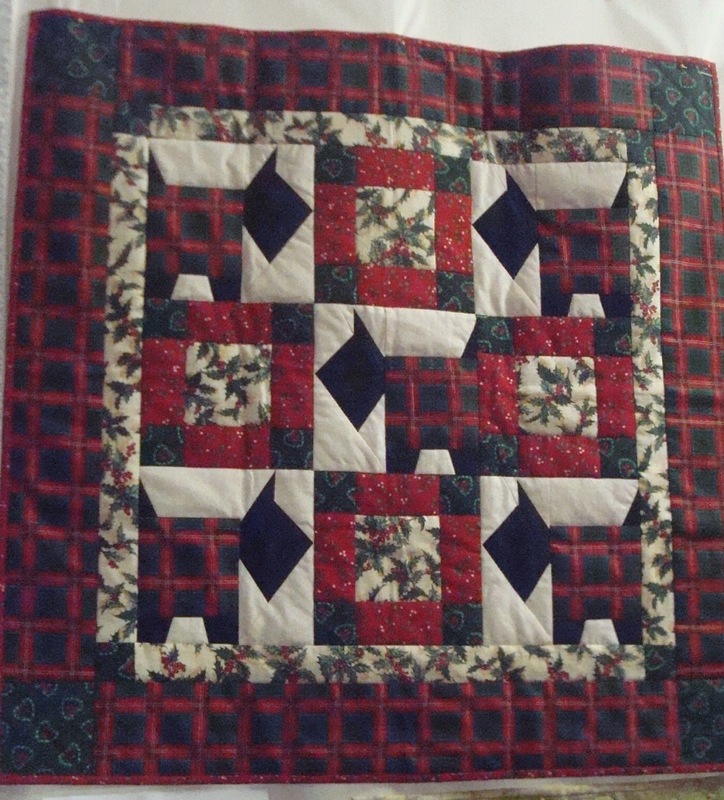 I will put on one more solid border and call it complete and ready for quilting. 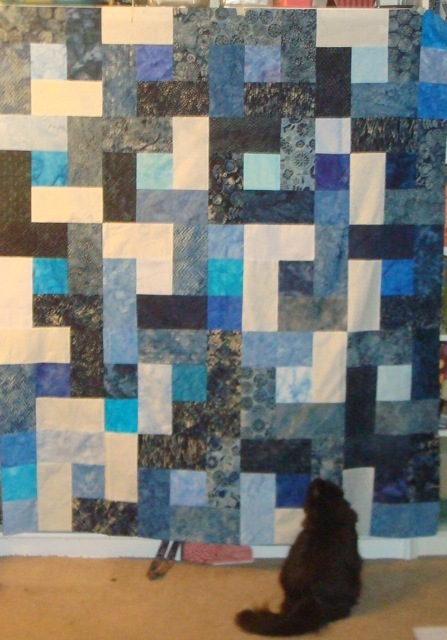 I got a bunch of blue batiks from a friend to make the background of a quilt for her. I probably worked more on that than on the spools, since the spools were frustrating me towards the end of the project. Which lead me to a very strange dilemma. I had planned the quilting order of my quilts up to Sunflower Lattice, but I couldn’t figure out what to do next. I guess I never thought I’d get those five quilts done, so I have no batting or backing earmarked for future projects. Dither, dither, dithering. What to quilt next? For the long-arm. I’m starting In Full Bloom. I pieced a back but still have no idea of what motifs to use to quilt it. 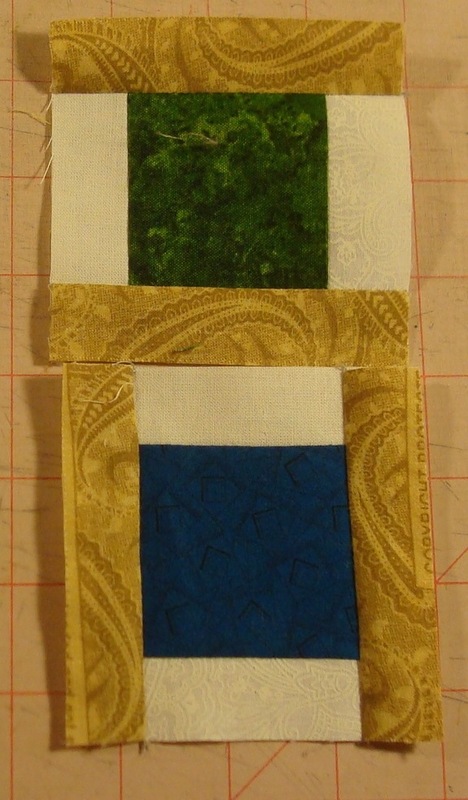 It will give me some practice in planning border quilting on the long arm since there are multiple borders. The next quilt to be quilted will probably be Aiming For Accuracy, and then, maybe Spirographology. I’m also thinking of basting Starina to quilt by hand starting in the Fall. I know I’ve said that before, but this time I really, really mean it! And, yes, I WILL get the threads buried and the binding put on Got Dots as soon as I get over the fact that it didn’t quite turn out as I had planned. 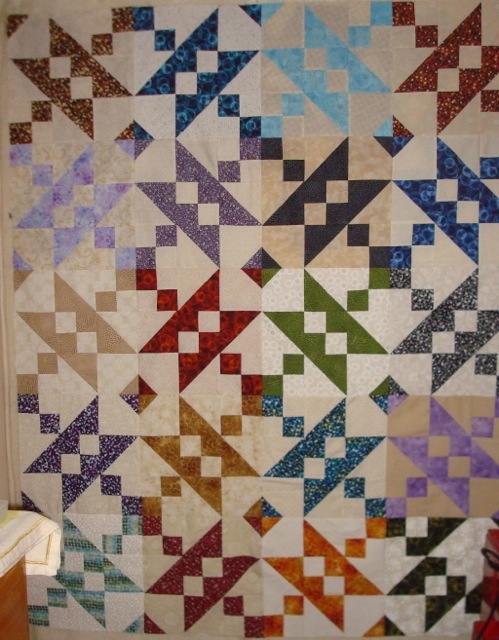 Next up in the Borderpalooza will probably be either the Civil War Sesquicentennial quilt (i,e, the first of Barbara Brackman’s block of the week quilts I did) or, possibly the Road to Ruin (which I thought I had a blog post about long ago, but I can’t seem to find it.) I probably called it something else. I have no clue of what to do with either of them. So, I guess I was busy enough without blogging, but I will try not to let it go as long between posts again. Fresh off the long-arm, Daystars only took two sessions and now needs to be bound. I guess my joy at posting on time last week was short-lived. I missed Thursday again this past week, although I did make it to Cricket’s for long-arm time. 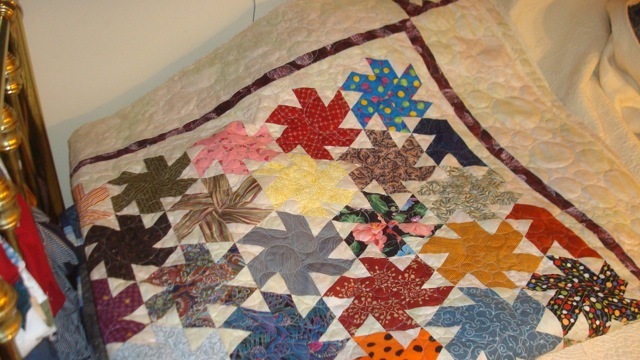 Today I am binding Daystars, which I finished quilting on Thursday. I had planned on using a Baptist Fan, like Catherine Wheels, but that wasn’t available, so I used these bubbles. I think they’re cute! I have also chosen binding for Got Dots, but I still have some machine quilting to do on the DSM. My Merritt seemed to have problems with the thread I was using on top, so now I plan on seeing if I can get either the 99 or the Featherweight to cooperate. Yes, after some consideration, I chose the small, finicky spools for the border. The others just didn’t seem to be in the right proportion. And, of course, I am in the throes of making of spools. When I “left” you last week, I was deeply troubled by the spool dilemma. I had several (actually 3) ways to make the spools for the border and one of them took considerably more time and brain power than the others. Since my brain has not been exactly humming along recently (witness the dozen or more extra leaves I made for In Full Bloom, among other things), I was trying to wiggle out of making the complicated ones, even though I liked them the best. To end this post, I hope everyone has a nice weekend. In the U.S., it’s Memorial Day weekend, which is everyone seems to think is the time for cook-outs and gatherings. On Memorial Day, of course, we are really supposed to remember the people who served in the armed forces and died for their country. None of my immediate family was killed in a war, but several who had served are gone now: my dad’s family was traditionally Navy (my aunt was a Navy nurse who commanded a floor of Bethesda Naval Hospital.) My aunt’s husband, Frank Shemanski (retired a full Commander and who had captained a ship) just joined her this past January. I like to take a moment to think about them and their stories on Memorial Day. Oh look! It’s Thursday and I’m actually posting. I did not get a quilt in because I really didn’t finish a show quilt I felt was good enough, but the rest of the Guild members made up for my lack. Our show has no ribbons. It’s sort of like a “standing Show and Tell”, which takes the pressure off. 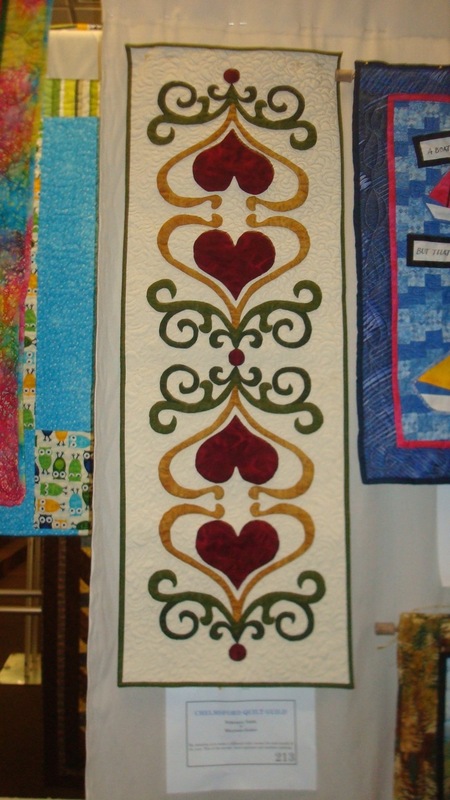 February Table was just one of the quilts my friend, the awesome appliquer Maryann Geiser showed. It was great seeing everyone and their quilts. We have a creative bunch! And I was very good. I really only bought a bag of scraps and a couple of books (and a lightbulb for my Merritt), entered a couple of raffles (didn’t win, as usual), schmoozed and had lunch. Our raffle quilt was also unveiled, but I don’t have good pictures of it (I’ll post one and a link for information when the official pictures are taken.) It was awesome. The quilting was done on the same long arm that I have been borrowing to do my quilts, but Cricket really out did herself! I was also astonished to discover how many of my fellow Guild members read my blog. It makes me want to be more timely in my posts. 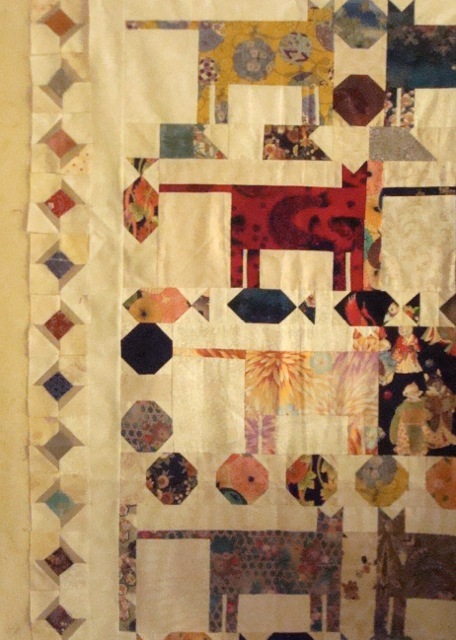 I got to talk about “Borderpalooza” and see if anyone had any suggestions for my Japanese Cats quilt. 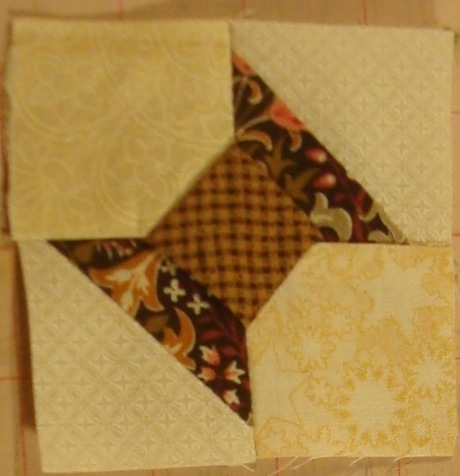 This Dimensional Spool block is one of the borders I am going to test out on Japanese Cats. A couple of days later, however, I woke up and had my own idea: instead of repeating a motif (I was leaning towards mice, but several people told me that the fish were cuter) I would make a new one. Miko plays with my empty spools, so I decided to use a spool block. This is a more graphic spool (and easier to sew), but I’m not sure it “reads” as spools when put next to each other. I found a couple of possibilities. One of which is a bit more graphic and the other a little more “realistic.” Right now I’m sewing several of the blocks up to see which looks best. The other block is plainer (and therefore easier to piece), but it doesn’t “read” like a spool even though it fits more with the “graphic-ness” of the other cat toys on the quilt. If you have any input (please!) or other suggestions, leave me a comment or drop me an email. Thanks! In all the quilting news, I forgot the last bit of rushing around for this week is prep for BRIMFIELD.